Season the venison meat with Greek seasoning and steak seasoning. Place in a bowl, and pour in enough Italian dressing to cover. Refrigerate for at least 2 hours to marinate, but preferably overnight. Preheat the grill for medium heat. Drain the marinade from the meat, and discard the marinade. 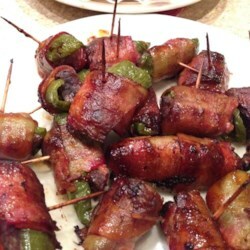 Place a slice of jalapeno on top of a piece of meat, then wrap with a slice of bacon. Secure with a soaked toothpick. Repeat with remaining meat. Grill the deer poppers for 15 to 20 minutes, turning occasionally to brown the bacon. Serve and enjoy!